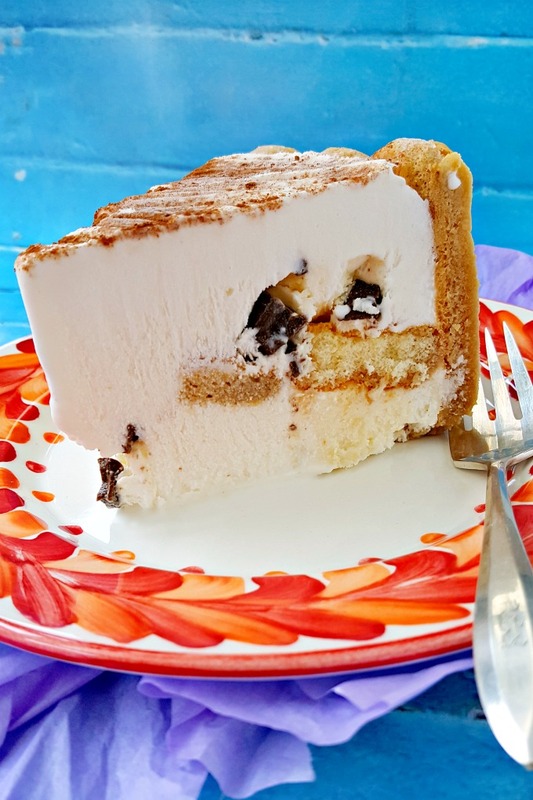 Taking the guesswork out of that cookie layer, Curious Creamery Tiramisu Ice Cream Cake has the flavors of a decadent tiramisu in a quick and easy ice cream cake form. It’s hot. So SO very hot. I mean, we have hit record temps here, I think. At least it feels like that. It feels like I want to just bury my head in my freezer and not come out until like, Thanksgiving!! I don’t remember it being this hot when I was growing up. Maybe it was and we just spent our summers at the pool so it didn’t seem so hot. My sister’s birthday is in August. I remember she always wanted a pool party and she always wanted an ice cream cake. And those new late 80’s ginormous subs that you could get. You know the ones, right? The store was new to us in the late 80’s anyway, but it’s the one where you could lose weight with them. Just for reference. Anyway, my sister loved those subs and ice cream cakes. I know we had them on more than one occasion for her birthday. Consequently, when I saw these Curious Creamery ice cream cake mixes out there, I immediately thought of her and her August birthday. I remembered all those ice cream cakes we ate, the pool parties we had, and those subs. Man, these parties were killer. It seemed like all of the neighborhood kids gathered around the table to sing, “Happy Birthday” while we watched the cake start to drip just slightly. What? It was dripping because there’s no refrigerator in that pool house!! We all waited patiently while the first slice was cut and we could see how delicious it was going to taste. At the same time, we all KNEW what it was going to look like because there aren’t many choices with those cakes. It was chocolate or vanilla or half and half. There were chocolate cookie crumbs in the middle. At least that’s how I remember them. I look back on 10-year-old me and just laugh at how naïve I was. Unlike this cake right here. With the Curious Creamery ice cream cake mix, you can make any came you want. ANY cake you want. Honestly. I was 10 again waiting for that first slice to come out. And that first bite? Oh my word. You see, unlike those OTHER ice cream cakes, Curious Creamery allows you to customize your ice cream cake. Like my tiramisu version that has delicious lady fingers, mascarpone, and espresso chocolate bits. OH yeah baby. I took it there!! That decadently delicious Italian dessert is now an ice cream cake with coffee dipped lady fingers around the edge, mascarpone and espresso chocolate bites in the middle. And just because I don’t like to throw perfectly good food away, I took the nibs of cookie I had to break off to make them fit the pan and put them in the middle of the cake. Yup. There’s a layer of delicate, coffee flavored lady fingers in the middle. 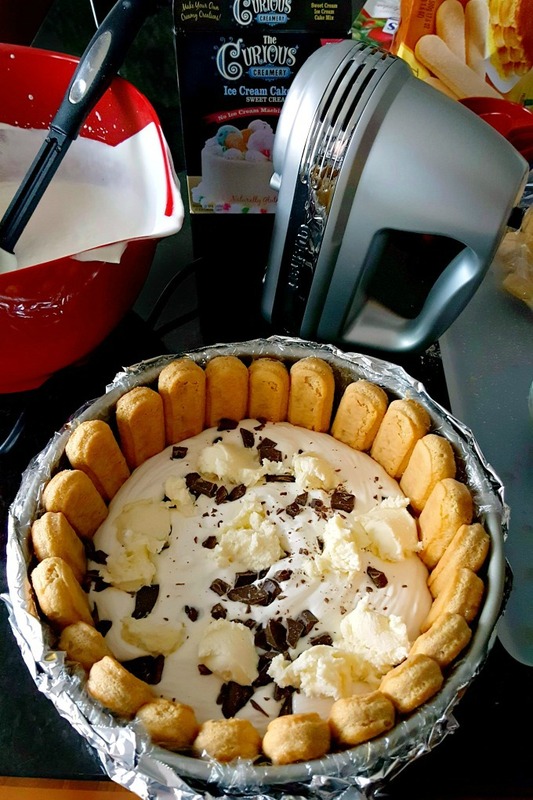 Curious Creamery ice cream cake mix allows you to take it there, too!! For instance, banana split cake? You got it! Grasshopper? On it! MUDSLIDE!? Uh huh. Rocking that grown up cake, too. Did I tell you how addicted I got to mudslides recently? It’s like grownup milkshakes. So good. Yup, you read me right. These ice cream cake mixes aren’t just for kids anymore! Want to adult-ify my version? Add some coffee liquor to your coffee and you’ve transformed it into a grown up dessert suitable for any dinner party. Now, I know this sounds like it’s a difficult cake to make. It truly isn’t. The Curious Creamery cake mix is so simple to make with ingredients you can get at your local grocery store. I got mine at Walmart up the street along with the espresso chocolate…in the coffee aisle of all places! I also got the mascarpone there, too. The lady fingers I had to hunt for, but if you’re lucky enough to have them at your store, then you’re golden! I honestly whipped this baby up before dinner. It was that easy. You know what the part about is about Curious Creamery? They have reduced the carbon footprint of their mix and ice cream cakes by 90% over those other products. NINETY! PERCENT! By allowing you to make their mix with your local dairy, selling a shelf stable and non-refrigerated product, and allowing for ambient temperature storage, Curious Creamery saves the energy required to ship pre-made ice cream in refrigeration trucks. That’s how ninety percent. That’s just mind blowing. It’s also mind blowing that the Curious Creamery ice cream cake mix is definitely a smarter choice than those other pre-made cakes. The mix is gluten-free, preservative free, cholesterol free, and has none of those artificial colors or flavors. You will have no worries about making a cake for anyone, any time of year! You control what goes into this ice cream cake mix. That cookie crumb layer I talked about earlier? I have no idea what really was in the middle of those cakes, but with this cake mix, you put in it whatever you want. Which means that they’re not just for summer and not just for birthdays. They’re for ANYTIME! Can’t find it in your local store? Don’t forget to check the cake decorating (“celebration”) aisle of your local Walmart before having a chat with the store manager and requesting that they start stocking the ice cream cake mix. I know they won’t regret it once they see how this Curious Creamery ice cream cake mix will fly off their shelves. And since it doesn’t have to be refrigerated and only takes up just a little space on their shelf (at first anyway) they would be crazy not to order it. Now, I just have to give Curious Creamery mad props. I received this little box in the mail and when I opened it, I felt so special to be part of this campaign. Honestly. Just look at that little package. And that ribbon! SO CUTE! Yes, that IS a handwritten, scrapbook card. I couldn’t wait to get to Walmart and purchase thieir mix. With this attention to detail, I will be stalking them on Facebook, Twitter, Instagram, and Pinterest to find out when new flavors or offers are introduced. Oh, and I will totally be wearing that adorable ribbon in my hair. Now, I know y’all are dying to head to the store and find this amazing ice cream cake mix. Taking the guesswork out of that cookie layer, Tiramisu Ice Cream Cake has the flavors of your decadent tiramisu in a quick and easy ice cream cake form. Line the inside of an 8 inch springform pan with plastic wrap. Cover the bottom of the outside of the pan with aluminum foil. Combine the mascarpone with the powdered sugar and beat until fluffy. Set aside. Quickly dunk the lady fingers into the coffee and place them, vertically, around the inside of the springform pan (I had to break off about an inch of the cookies I purchase to make them fit the height of the pan). Set aside. Follow the package directions on preparing the ice cream cake mix beating the whipping cream, milk, and sugar until thick and wavy. Pour half of the mixture into the pan. Using a teaspoon, drop the mascarpone into the ice cream cake mixture. Sprinkle with the chocolate and then pour the remaining ice cream mixture into the pan. Cover with plastic wrap and freeze 2 to 6 hours or until firm. Such an impressive cake! It looks delicious! Thank you! They loved it at work. Thank you! It’s sooo good! I took it to a work party and they devoured it. DEVOURED! I’m making another one this weekend. This looks so delicious specially in this days that the heat is so so hot. My cooking blog is in spanish with google tranlator so i hope you liked. Thank you! Yes it has been very hot here. I can’t wait to read your blog. You had me at tiramisu! This looks awesome.!!!! Thank you Denise!! It’s so good. Those cookies dipped in coffee are total crack.